I designed very high quality, wire knitted bracelets by using very high quality beads, and stones. * It is a unique, complete piece of art which combines various techniques. * This bracelet is carefully knitted with a really soft wire, called "flower wire". 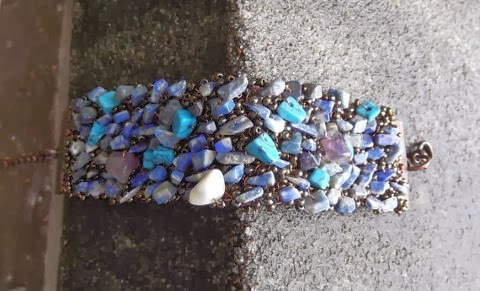 * All the beads used in this bracelet are natural stones, and seed beads. * Bracelet has a chain at the end which makes it easy to fit all sizes. However, please let me know about your wrist size while checking out if you want a little longer chain. The design is new and ready to ship. It can also be customized according to your size.